I wanted to do something interesting with my pizza tonight, and the terrific bacon in my fridge sparked the imagination. 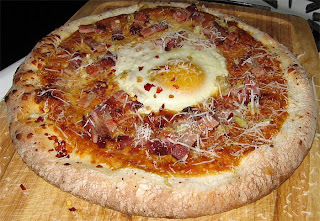 Next thing I knew, I had added the bacon, an egg, garlic, red pepper, and pecorino romano to my pizza. It turned out beautiful, and really, really good. The egg adds moisture and a silken texture. It's carbonara, on a pizza. The only trick to this is to time the egg right. You can't place it on the pizza right away, or the egg will be overcooked by the time the crust is done (and vice versa). My pizza cooks for 10 minutes, so I put the egg in there at about minute 4 or 5, just enough time so that the whites turn opaque.